April is a soprano with a passion for nuance and text which gets to the heart of both music and character. Equally at home on the opera stage, concert hall and recording studio, April has recently premiered the title role of John Joubert’s opera Jane Eyre in a live concert recording for SOMM (due for release in March 2017). With a growing reputation for championing new works, she has also premiered Philip Sawyers’ Songs of Loss and Regret, and Laurence Osborn’s Micrographia with the Riot Ensemble. April’s discography features several premiere recordings including Barber’s Knoxville: Summer of 1915 and Copland’s Eight Songs of Emily Dickinson. She returns to her beloved Strauss’ Vier Lezte Lieder in 2017 in Manchester, Blackburn and Nottingham as well as to Knoxville with the Cheltenham Symphony Orchestra, Vaughan Williams’ Sea Symphony and Bach’s St John Passion with Dei Gratia Baroque. Initially pursuing violin, April began to train in voice at University of Northwestern St Paul with Catherine McCord-Larsen, where her time as a violinist behind the baton shaped her attitude toward the role of a soloist as part the ensemble. Her layered, in-depth preparation and close attention to fine vocal colour were honed by her time in the College Choir, and her life-long preoccupations with Mahler and the effect of World War I on British music and culture and her commitment to music in all its cultural and historical dimensions were also fired by her music history training there. She went on to gain an MMus and PhD at the Royal Academy of Music, where she studied with Jane Highfield, Ian Ledingham and Dominic Wheeler. She sang regularly with the RAM Lyric Song Salon, the RAM Historical Performance ensembles, Academy composers, and in masterclasses with James Bowman, Robert Tear, Graham Johnson, Rudolf Jansen, and Roger Vignoles, with whom she went on to do a full course in lieder and chanson with Vignoles in Austria. She now studies with Jacqueline Straubinger-Bremar. She has been fortunate to work with an incredible array of fine musicians from a wide variety of traditions, from Jacek Kaspzcyk and the Warsaw Philharmonic to folk musician Joe Jencks, from Graham Johnson and the Young Songmakers Almanac to David Parry and the English Chamber Orchestra, from Dei Gratia Baroque Ensemble (of which she is a founding member) to Indian classical musicians through the innovative Blake-Nazrul project of Song in the City. She is a regular collaborator with pianists Mark Bebbington and Amy de Sybel, the Orchestra of the Swan, the English Symphony Orchestra, the Kensington Chamber Orchestra, Nottingham Harmonic Choir, the Leicester Bach Choir, the Wrexham Symphony Orchestra, and the Cheltenham Symphony Orchestra, and she has worked and recorded with Coro Cervantes (specialising in Iberian and Latin American music) and the Elysian singers. She was also involved in the launch of the Beethoven Orchestra for Humanity. She is equally at home on the opera and concert stage, in both grand and intimate settings, endeavouring to bring a chamber aesthetic and personal connection to every performance. Her recent world premiere of the role of ‘Jane’ in Jane Eyre with the English Symphony Orchestra, described as ‘astonishing and luminous’ (Bachtracks), ‘utterly riveting, with a terrific dramatic sense’ (Music and Vision), and ‘simply breathtaking’ (Musical Opinion), was voted Classical Music Magazine’s Premiere of the Year. On the opera stage, she has sung the ‘Countess’ in Opera de Baugé’s Marriage of Figaro and ‘Königin der Nacht’ in The Magic Flute for Woodhouse Opera, and ‘Medea’ in Handel’s Teseo at Piggott’s. In recital, she has sung with Graham Johnson in the Young Songmakers Almanac, Mark Bebbington at the Little Missenden and John Ireland Festivals, with William Vann at the English Song Festival, and with Amy de Sybel in a programme of all Ivor Gurney songs for Remembrance Day at the In Flanders Fields Museum in Ypres. Her orchestral collaborations include Britten’s Les Illuminations and Shostakovich’s intense, uncompromising Symphony 14 with the Orchestra of the Swan, Berlioz’ Les Nuits d’Été with the Cheltenham Symphony Orchestra, Villa-Lobos Bachianias Brasilieras no. 5 and Gorécki’s Symphony of Sorrowful Songs with the Beethoven Orchestra for Humanity, and she has sung Strauss’s Four Last Songs, Barber’s Knoxville: Summer of 1915, Mahler Symphony no. 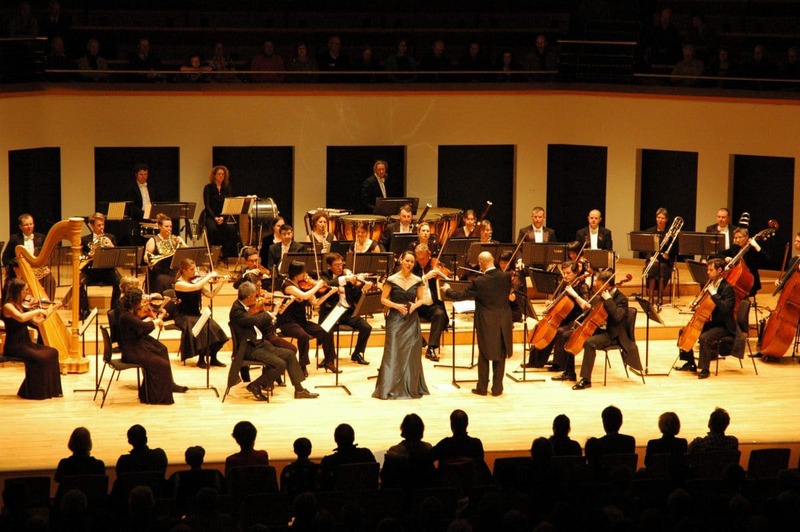 4 and Mozart’s C Minor Mass with ensembles throughout the UK. Through her ensemble D’Accord, she is also pioneering a new wave of house concerts aiming to re-invent the soiree for modern times. She is committed to contemporary music, having premiered works by Aaron Holloway-Nahum, Paul Evernden, Martin Suckling, John Hawkins, Laurence Osborn, Kerry Yong, Alan Laing, and Gloria Coates, and she is also passionate about site-specific and devised works that bring familiar repertoire into fresh contexts, singing in events with ensemble Multiplicity (of which she is also a founding member) mingling artwork and music on transformation and decay, a promenade event at Clissold Park and House exploring the disappearing pastoral through music by Vaughan Williams, Rebecca Clark, Bliss and Hols, pairing historical narration and sensory interaction. She is a founding member of Baroque ensemble Dei Gratia, which specialises in innovative period performances exploring the incredible wealth of religious Baroque music in its original context of contemplation and worship. Her other Baroque work includes the Bach Magnificat with the Leicester Bach Choir, Bach Mass in B Minor with the Elysian Singers and Paradiso Baroque, Buxtehude Membra Jesu Nostri with Laurence Cummings and the RAM Historical Performance Department, and the Scarlatti Stabat Mater with the City of London Choir under Hilary Davan Wetton. April also devised and premiered That Fragile Beauty, a multimedia, narrated performance exploring the experience and legacy of WWI through the lens of Ivor Gurney’s poems, letters and music and Paul Nash’s artwork as well as The Life That Suits Me Well, an immersive, multimedia event about the marriage and lives of Richard and Pauline Strauss. A ‘wonderfully innocent sound, fantastically clear diction and absolutely pure intonation’, Gramophone concluding that ‘not the slightest distance can be felt between her and the texts’, with MusicWeb calling her singing ‘humane and vulnerable: a beautiful voice, shining and round, celestial on the high notes and rich on the low ones…creamy timbre and velvety strength’. Her second release for SOMM was a solo disc of John Ireland songs with pianist Mark Bebbington, who has carved a place for himself as one of this generation’s finest interpreters of Ireland’s work and that of his contemporaries. Their collaboration was described as ‘hauntingly beautiful’, ‘atmospheric and sultry’ and ‘consistently commanding’, with ‘beautifully shaped vocals, admirable diction and a lovely lyric sympathy for Ireland’s music, always finely partnered by Mark Bebbington.’ Her third disc for SOMM will be the world premiere recording of ‘Jane’ in John Joubert’s opera Jane Eyre which she premiered live in Birmingham in October 2016, and her world premiere recording of Philip Sawyers Songs of Loss and Regret is also forthcoming on Nimbus. Future work includes a gala with the English Symphony Orchestra at Huntingdon Hall, Philip Sawyers Songs of Loss and Regret at St John’s Smith Square, also with the ESO, Barber Knoxville: Summer of 1915 with the Cheltenham Symphony Orchestra in the Pitville Pump Room, Strauss Four Last Songs with the Blackburn Symphony Orchestra, Vaughan Williams’ Sea Symphony, Brahms Requiem and Strauss Four Last Songs with the Nottingham Harmonic Choir and Orchestra da Camera, Bach’s St John Passion with Dei Gratia Baroque, and Mendelssohn’s Elijah with the Cambridgeshire Choral Society. She is also developing a fully staged version of Shostakovich Symphony 14 with Matthew Sharp and the ESO as well as a staged version of Schumann’s Frauenliebe und Leben.